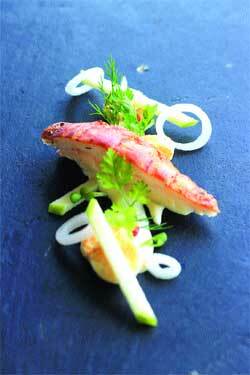 Discover French Grill's "smoked lobster tail"; an exclusive creation from Chef Szurek. The delicate flavors of the hot smoked lobster tail are balanced with fresh green apple and herbs sour cream for a unique tasting experience. Remove the meat from the shell. Season and marinate with ingredients. Smoke at 135oC for 25 mins. Chop the herbs and shallots. On a plate, spoon the sour cream. Dispose ½ lobster tail on the top. Garnish with herbs, shallots sliced and green apple sticks. You can sample the dish at JW Marriott Ha Noi, 8 Do Duc Duc Rd, Me Tri, South Tu Liem, or call (04) 3833 55 88 for reservation, or facebook.com/frenchgrill.